Are you ready for National Pie Day on January 23rd? Unifiller reminds small to mid volume bakeries of their depositors for pie production. From portioning pie dough, to transferring and depositing fillings, a Unifiller depositor offers so many options. The right depositor manufacturer will understand the need for product consistency and quality control as it affects a bakery’s brand and reputation. Unifiller understands taking pie production to the next level can be challenging. Increasing sales requires increasing production. Increasing production may require purchasing depositing equipment. To add to this dilemma, purchasing a depositor without testing in a production setting may leave one feeling uncertain. The right depositor manufacturer will understand the need for product consistency and quality control as it affects a bakery’s brand and reputation. Branding is more than just colors and images associated with storefronts; it’s also the perceived impression of a product. Many pie producers that fill pies shells by hand, run into the challenge of inconsistent pie filling weights which ultimately affects the taste, the look of their pies and their profits. 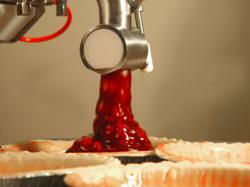 The right equipment provider will “fine-tune” the depositor for a customer's ideal pie production recipes. Companies, like Unifiller Systems, understand that the purchase of a depositor can be a business-critical decision for a bakery — that’s why they offer bakeries the option to test the depositor with “real” products before they buy. Call a Unifiller product expert today to arrange a free, no-obligation product test. Pie producers want to focus on pie production. They don’t want to waste valuable production time trying to setup and train staff on a complex machine. Before working with any equipment provider, make sure to ask questions about the ease of setup, ease of use, disassembly and cleaning. 4. Does the equipment grow with production? When planning the purchase of a depositor, it’s important to consider long-term growth strategy. Will there be a need for additional accessories or depositors in the future? Will production eventually be automated to a conveyor? When choosing a depositor, make sure the equipment is of modular design. Unifiller Systems offers plug & play machines — any of their machines can be easily configured over an automated production line to include depositors that portion pie dough, deposit filling and top pies with whipped cream or other toppings. 5. Does the manufacturer offer options to facilitate the investment? Few companies will work with you to analyze your operations and develop an ROI (Return on Investment) plan. Reputable depositing manufacturers will always ask the important question to better understand your business, including questions about production volume, batch size, filling viscosity. Call a Unifiller product expert today to arrange a free, no-obligation consultation. Stay tuned for Unifiller's next set of tips which includes tips of preventing strain and workplace injuries.